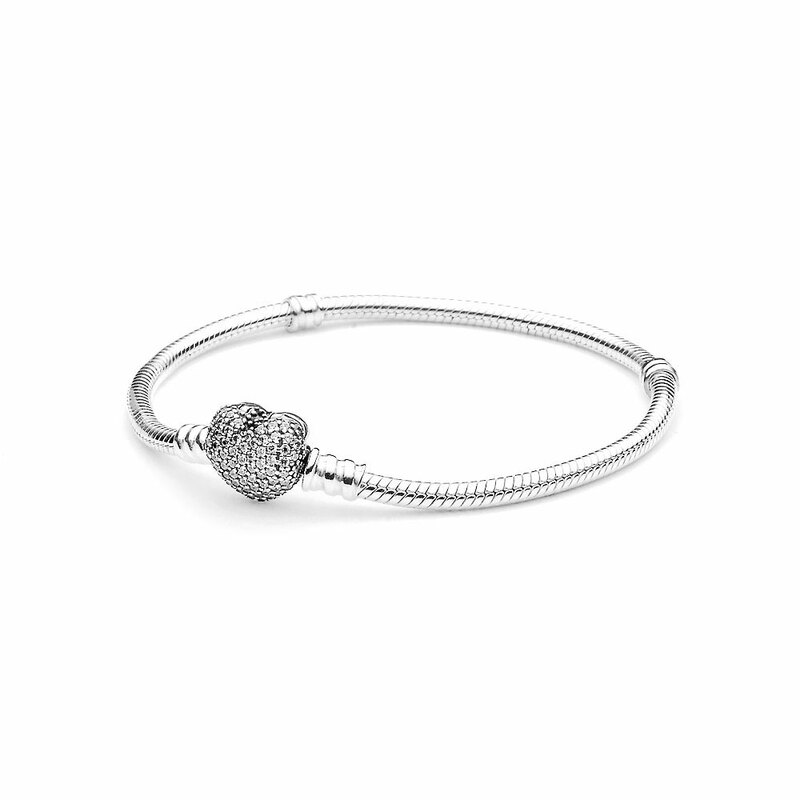 The classic PANDORA charm bracelet is now available with a pretty heart-shaped clasp embellished with dazzling stones on one sideand PANDORA logo on the other side. This bracelet is the perfect carrier for a collection of romantic charms and is sure to be treasured by every woman. MOMENTS Silver Bracelet with Pavé Heart Clasp is rated 4.6 out of 5 by 87. Rated 5 out of 5 by Luxxie from My Review for Pavé Heart Bracelet, Clear CZ i just received this beautiful Bracelet. and it fits perfectly. but the Heart doesn't Lay Flat. is that Normal ? or should i exchange it ? i love it otherwize. Rated 5 out of 5 by Peds NP from Beautiful & Sparkling I bought this piece, and fell in love with the clasp. The sparkling clasp goes well with all other charms one may add. Rated 4 out of 5 by Len411 from Beautiful and classic I bought this for myself it’s very difficult to put on or close. Rated 4 out of 5 by Farmer from Bracelet Just bought this bracelet and was impressed with the design and quality. I must say,though,the clasp is a bit difficult to open and close but was assured that it would be easier as it was used. The web site is a bit tedious as far as information concerning clasps,clips and spacers and how to assemble the various items. If you have a bracelet, there are no problems but if you are just starting there is no information to make a decision on what or how to purchase. Rated 4 out of 5 by iviichka from Beautiful Bracelet This has to be the most stunning bracelet Pandora has put out...only issue is that the clasp is hard to open and close especially if you have nails but my boyfriend got it for me and I still love it. Rated 5 out of 5 by Essence 01 from Awesome Combination!! I bought these bracelets and charms on June 18, 2016 and I just can't stop looking at them. I just had to treat myself for having a very challenging year at work. So Pandora was my choice for gifting myself with something special and beautiful. Thank you Pandora, just Beautiful!! Rated 5 out of 5 by Maria BA from Pics and bracelet Love the pics, are perfect description to buy, it’s exactly as the pic. Isn’t very flexible, it’s a little hard to fasten.